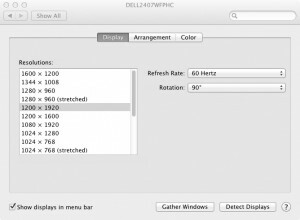 This post is being written on my (almost) new Dell U2410 monitor. I picked it up cheaply from Graysonline. I get a lot of my kit from there. They often have cheap/reconditioned Dell bits available and you can usually purchase them for under half price. The U2410 is a well regarded high-end monitor and I concur with the reviews. It is now paired up with my older Dell 2407WFP. 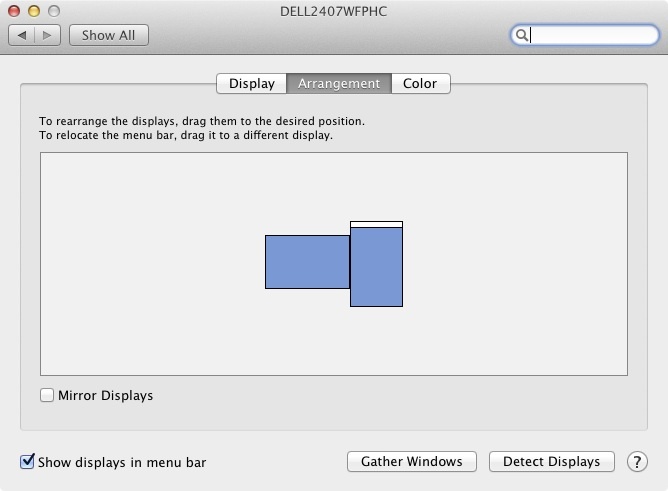 So now I have two Dell 24 inch screens plugged into my Mac mini. The Mac mini only has one HDMI port so its not obvious if a second screen is supported. So before I placed my bid, I checked online to make sure you can actually plug a second screen in. Sure enough, Apple have thought about this and all you need is a Apple display port to DVI converter. Apparently the Thunderbolt port on the Mac Mini is backward compatible with the Apple display port. So its simply a metter of plugging one screen into the HDMI port and the other into the Thunderbolt/Displayport with a DVI converter. 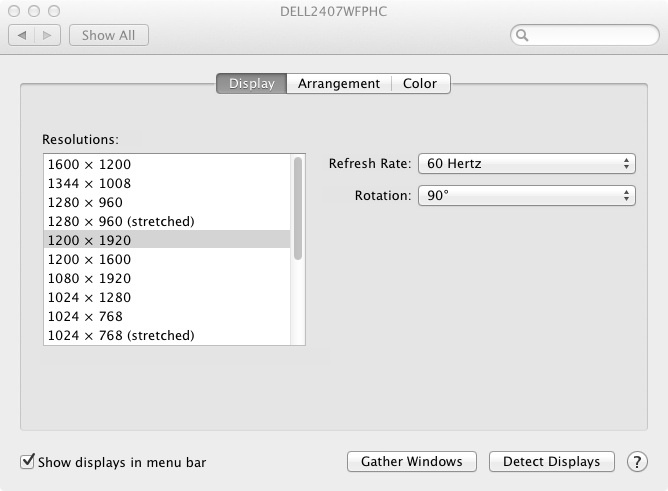 On reboot, Lion detects the screen models and maximum resolutions automatically – just as you’d expect with Apple kit. The only configuration required is to tell Lion which screen is primary and how the screens are physically located on your desk (so you can move the mouse from one to the other). There are two issues I have struck. Firstly, I have set the older screen in portrait mode (ie rotated 90 degrees). This was mainly to save desk space but now that I have done it, I understand why so many do this. The widescreen mode just does not make sense for daily browsing or document editing. On the other hand though portrait mode does not work so well for videos. Anyway, Lion seems to have a bug on the HDMI port when one screen is rotated. Simply put, the screen on the HDMI port just hangs. I eventually got it to work but unfortunately have no idea how other than I swapped the screens, rebooted a couple of times and then tried combinations of resolutions and which screen to rotate first. I think I hit it by flicking the resolution of the HDMI attached screen down a notch or two first, change the rotation and then changing the resolution back up to native. The second issue is the way “full screen mode” works on Lion. Its a well known issue but for those of you who do not have two screens, let me say – its just a dumb implementation. In Lion, selecting full screen mode of any application forces that application to full screen and makes the other screen display the linen background from the bootup screen – not black mind you – an annoying shade of slightly bright grey. Also cycling through desktops (Control -right/left) does not resolve it – each screen has its own set of desktops. Its not the end of the Earth as some have made out on the boards – as you can simply not use full screen mode and go back to maximised mode – but it is annoying and suprising coming out of Apple. The Dell U2410 is an excellent screen and the Mac Mini continues to impress. Lion, however, could do with a bit of work. As regular readers will have noted, my preferred music encoding format is FLAC. My whole music library (>7,000 tracks) is FLAC at 16/44.1 or higher. I am a fussy listener and I do not want to even have any chance of compression artefacts interfere with my music listening. This is problem for me now on Mac OSX as the standard music player is of course iTunes – and iTunes does not support FLAC. Now before all you geeks tell me I should be using Apple’s answer to FLAC – ALAC – I would but ALAC is not well supported by UPnP AV servers and clients – most notably my ONKYO network amplifier. Also I can convert from FLAC to anything – including MP3, AAC for portability. So the search began for a music replacement for iTunes. Put simply, I wanted the library and user interface of iTunes and support for FLAC but none of the “useless” iTunes bloat – video, apps, itunes store, genius, syncing etc. For a while Vox was the best I could find. It supported FLAC but the user interface is a throw back to the Winamp days. We have moved on a bit since then. Enqueue is the answer. It does all I want – music FLAC support (all resolutions) library scanning, album art and even bulk tag maintenance (with art). You can setup playlists and it can show some graphs re your playing history. The only gripe I have is that at higher bitrates (eg 24/96), it stutters. I suspect this may be more to do with my LAN than Enqueue but it would be good if it buffered a bit more like Vox obviously does (which never stutters). Music players should not assume they have local access to music on a local hard drive. Other than that one gripe, Enqueue great value at A$10.49 from the AppStore. Firstly, let me thank everyone who read my first two articles on setting up a free Minecraft server in the cloud with Amazon EC2. The posts have proved very popular and are currently accounting for about 80% of all traffic to this blog. So due to popular demand here is the third article in the series. It’s becoming an annual event: a Boxing Day plea for help from one of my friends trying to get their new Apple device working for a young child.